"Warning: You may or may not hear something interesting on this record"
"If it's a success it must be Magic!" On the run out groove the catalogue number has ABRA stamped but then has MUG hand scratched, but scratched out not quite well enough to make it illegible followed by 1, suggesting that the catalogue number for this was originally intended to be MUG 1. This has grooves pressed on both sides (eight tracks on the A side and nine on the B side), which look convincingly like proper tracks, however, the record is silent on both sides. In reality this is an anonymous release from Stiff records. Incredible disc, ideally played whilst watching Clinton coughing when awkwardness overcomes her and casually perusing the Trumpsters Art of the Deal tome. Should be reissued as the "Wisdom and wit of Donald Trump".. would have the same content as this anyway.. It doesn't read 'MUG', it says 'MAG' as in Magic Records. It would have been 'MAG 1'. Magic Records were really Stiff Records in disguise. This was released partly as a joke and partly as a publicity stunt. The record is blank on both sides but is very cleverly pressed to look like there is a recording on it. There are numerous different shades of black, just as on a real recording. 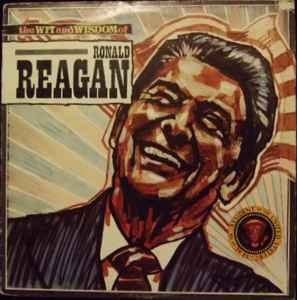 There is nothing at all anywhere on the sleeve or label to suggest that this record is silent, except for the obvious point that there was no "wit" or "wisdom" from Ronald Reagan to actually record. The run out groove would suggest that the initial intended catalogue number for record was the rather apt "MUG 1".